Each week, over the next eight weeks, we're releasing a video featuring a winery and tasting notes from different wine regions we visited on our recent trip to Italy. This week, we begin in Italy's northernmost wine region, Alto Adige. It's an unheralded region and for a closer look, we toured the vineyards and winery of Alois Lageder. Its fifth generation CEO who bears the same name, knows this region well. Winemaking has been a part of the Lageder family history for more than a hundred and fifty years. After many years of growing organically, Alois Lageder took the winery one step further in 2004 by committing to biodynamic growing on its fifty-plus hectares. They meet Italian Demeter standards, but more than that, the vineyards are alive with birds and insects. Pinot grigio is the most cultivated grape in Alto Adige and Alois Lageder's is widely acclaimed. 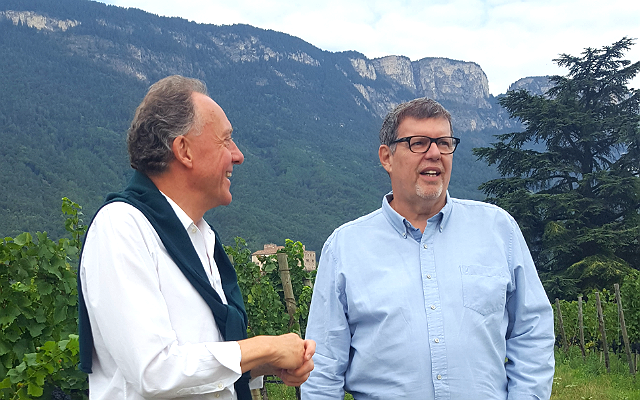 In the video below, we speak with Alois Lageder and his son Clemens, learning about their wine and their past, present and future, and you can take a look at their lush, vibrant vineyards. Our full tasting notes are below.